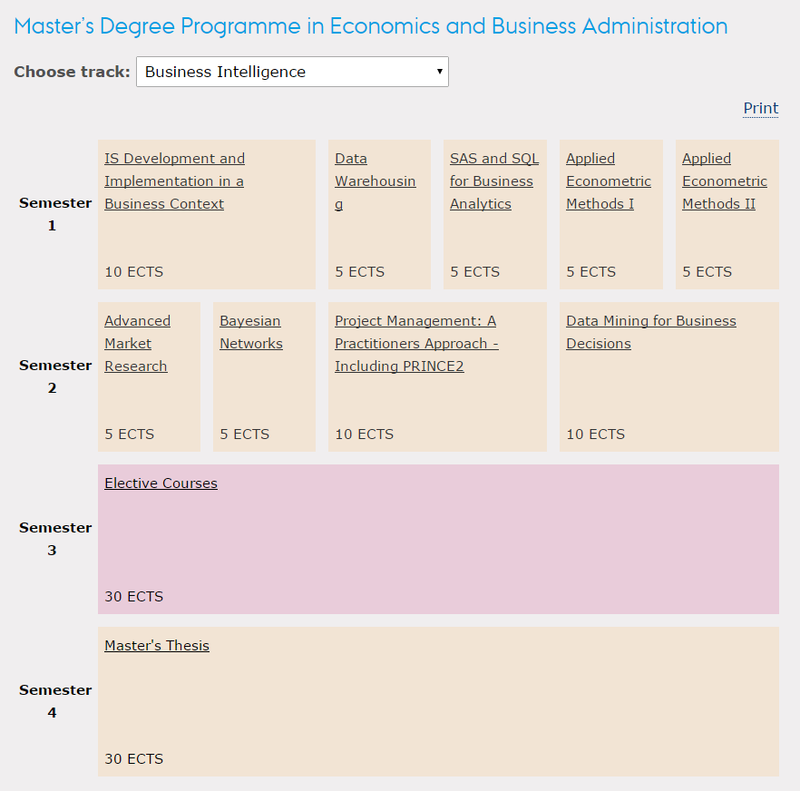 The MSc BI programme is still new and the structure of courses and their content have been changed and will continue to change slightly, in order to constantly improve the scope and adapt to the demands in the field of Business Intelligence outside the university. Information systems are vital for modern businesses. Information and the ability to process information are vital to exploit own resources, optimize production, and reach customers and other stakeholders. Many new business models are enabled by new forms of information processing, and all businesses need to continuously update their information systems (IS) to optimize their business performance. This process crosses the border of business and IT, and interdisciplinary skills are needed. Building an analytically enabled enterprise can be a daunting task. The various operational systems (ERP, CRM, SCM) in a typical Company create vast amounts of data that are spread through many disparate systems. Furthermore, the number of potential data sources of relevance to decision-making in the Company is expanding rapidly including Social Media Data and sensor data (aka). In order to efficiently transform data into information and to deliver this information in right format, to the right user, at the right time at the right place, the Data Warehouse is an important element in the Enterprise Information Infrastructure. However, the traditional, central Data Warehouse has been challenged by the financial crisis, the emergence of Self-Service BI-tools, Big Data and the way that Business Intelligence is organized. The aim of the course is to introduce the participants to (a) various Data Warehouse Architectures including the Logical Data Warehouse and (b) methodologies to successfully build and maintain the Data Warehouse. As a starting point the course will introduce the traditional hub-and-spoke (Inmon) and Bus (Kimball) approaches to Data Warehousing. Building on this the Logical Data Warehouse is introduced to include support for Self-Service BI, agility and Big Data. Furthermore, the course will cover iterative methodologies and agile practices for building and maintaining the Data Warehouse. Finally, different organisational designs for supporting the Data Warehouse are discussed. Data analysis is a practice in which raw data is ordered and organized so that valuable information can be mined from it. The procedure of shaping and thinking about data is a key to understanding what the data does and does not comprise. Analysis of data is a process of scrutinizing, cleaning, transforming, and modelling data with the goal of emphasizing beneficial information, proposing conclusions, and supporting decision-making. Data analysis has several facets and approaches, including various techniques under a whole range of names, in different business domains. Statistical programming is a prerequisite for conducting proper data analysis. All this can be done in a number of different computer programmes. SAS is one such widely used programme. Skill in high demand in many industries. Applications in Research Methods, Data Mining, Business Intelligence, CRM, etc. The purpose of the course is to introduce the students to some of the most widely used estimation techniques in econometrics. The course provides basic tools for modeling and estimating econometric systems. In addition, the students get hands-on experience analyzing financial data using econometric software. The focus of the course is on application and practical implementations. The course is a prerequisite course and it introduces basic econometric techniques that will also be used later in the MSc programme. When entering the course, the students are expected to have completed Applied Econometric Methods I. The course extends the time series analysis from Applied Econometrics Methods I with special emphasis on relevant financial models and applications. Furthermore, estimation techniques such as GMM and Maximum Likelihood are also introduced. Projects are essential for implementing an organization’s strategies (strategic alignment). Project Management Models “support” the way in which we make projects. Project management becomes a career path (you could obtain different certifications i.e. IPMA, PMI, PRINCE2). Therefore the overall aim of this course is to introduce the contents of general project management competences. Project management disciplines are generic, and therefore a major topic in this course will discuss how these disciplines are tailored to specific projects and into specific domains. Introduction to PRINCE2 (one of the most widely used project management models). The project management “toolbox” (the hard part of project management). Leadership and teambuilding (the soft part of project management). Organisational implementation and resistance against change. Data are at the heart of many core business processes in a modern company. Data are generated by transactions in operational systems and are being warehoused to become part of the corporate memory. In industries such as banking, insurance, media, telecommunications, retailing, and e-commerce, the amount of data is often so vast that companies complain about “drowning in information but starving for knowledge”. Data mining is the art and science of transforming data into knowledge, knowledge into action, and action into value. Data mining skills are in ever-increasing demand in all industries that generate “big data” and are vital to all corporate functions that deal with such data. Business applications range from marketing (e.g., prediction of campaign response), accounting and finance (e.g., fraud detection) to logistics and supply chain management (e.g., inventory forecasting). Discovering meaningful patterns in “big data” (clustering, association rule mining). Predictive analytics (regression approaches, nearest neighbour, decision trees, neural networks, support vector machines, Bayesian networks). Model assessment and selection (bias-variance trade-off, partitioning and cross-validation, signal detection theory, decision analysis). The confluence of more powerful information technology, advances in methodology, and management’s demand for an approach to marketing that is both effective and accountable, has fueled explosive growth in the analysis of the large customer transaction databases that many companies possess. The business world has changed in recent years, largely due to the developments and influence of global competition, information and analytical technologies. Managers’ intuition becomes suboptimal and best firms are already using extensive data and detailed analytics to manage uncertainty and make the correct decisions. Much evidence shows that the use of analytics systematically leads to better business performance and competitive advantage. Bayesian networks are an advanced analytical method for reasoning and taking decisions under uncertainty. Bayesian networks are highly relevant to solving business problems and are currently in everyday use in areas such as finance (e.g. in credit scoring domain, customer’s credit-worthiness, portfolio decision making), insurance (e.g. in fraud detection), marketing (e.g. in customer loyalty, advertising, marketing planning, and customer relationship management), business management (e.g. in supply risk management, ecosystems and environmental management), and in many other business and non-business domains. Bayesian networks belong to the family of probabilistic graphical models and combine principles from graph theory, probability theory and statistics. In the third semester you can choose elective courses within your areas of interest. The courses can either be taken at School of Business and Social Sciences during the semester, at the Summer University or at one of our more than 300 partner universities abroad. You can also participate in internship programmes either in Denmark or abroad. The fourth semester is devoted to the final thesis. You may choose the topic of the thesis freely and so get a chance to concentrate on and specialise in a specific field of interest. The thesis may be written in collaboration with another student or it may be the result of your individual effort. When the thesis has been submitted, it is defended before the academic advisor as well as an external examiner. The course progresses from the methodological and statistical foundations taught in a typical undergraduate programme in Economics and Business Administration. It provides an intermediary treatment of the research designs, measurement approaches and statistical methods commonly used in business intelligence and management information systems research. The aim of the course is to introduce the participants to (a) various Data Warehouse Architectures including the Logical Data Warehouse and (b) methodologies to successfully build and maintain the Data Warehouse. As a starting point the course will introduce the traditional hub-and-spoke (Inmon) and Bus (Kimball) approaches to Data Warehousing. Building on this the Logical Data Warehouse is introduced to include support for Self-Service BI, agility and Big Data. Furthermore, the course will cover iterative methodologies and agile practices for building and maintaining the Data Warehouse. Finally, different organizational designs for supporting the Data Warehouse are discussed. Data analysis is a practice in which raw data is ordered and organized so that valuable information can be mined from it. The procedure of shaping and thinking about data is a key to understanding what the data does and does not comprise. Analysis of data is a process of scrutinizing, cleaning, transforming, and modeling data with the goal of emphasizing beneficial information, proposing conclusions, and supporting decision-making. Data analysis has several facets and approaches, including various techniques under a whole range of names, in different business domains. Statistical programming is a prerequisite for conducting proper data analysis. All this can be done in a number of different computer programs. SAS is one such widely used program. Data are at the heart of many core business processes in a modern company. Data are generated by transactions in operational systems and are being warehoused to become part of the corporate memory. In industries such as banking, insurance, media, telecommunications, retailing and e-commerce, the amount of data is often so vast that companies complain about “drowning in information but starving for knowledge”. Data mining is the art and science of transforming data into knowledge, knowledge into action, and action into value. Data mining skills are in ever-increasing demand in all industries that generate “big data” and are vital to all corporate functions that deal with such data. Business applications range from marketing (e.g., prediction of campaign response), accounting and finance (e.g., fraud detection) to logistics and supply chain management (e.g., inventory forecasting). The confluence of more powerful information technology, advances in methodology, and management’s demand for an approach to marketing that is both effective and accountable, has fueled explosive growth in the analysis of the large customer transaction databases that many companies possess. This course is devoted to customer base analysis and predictive modeling with a primary focus on customer life time value and customer retention, but aspects relevant for cross-selling and up-selling will also be discussed. The methodological part will cover discussions of the different lifetime value models developed and the related statistical models such as logistic regression and survival analysis. The process of designing an appropriate supply chain performance management system is difficult due to the complexity of supply chains. The complexity derives from the size and geographical dispersion of supply chains, as well as from the business process and inter-company perspectives employed in supply chain management. This course aims to provide an introduction and a framework to the design and operations of performance management in contemporary supply chains. Supply chain performance management solutions encompass relations to ERP systems as well as to business intelligence and planning software, scorecards and dashboards. Benchmarking is also an important method that is used in performance evaluation. Models and tools such as BSC, GSCF, SCOR, and DEA need to be considered in the design of supply chain performance management systems. In particular, the SCOR model provides a framework that links processes, metrics, best practices, and technology to improve supply chain management.